What makes one cheesecake better than another? Texture. A good cheesecake has a creamy, luscious custard on top of a buttery crust. Cheesecake never excited me until I met this cheesecake. Get the recipe here. We learned how to make superior cheesecake from pastry chef extraordinaire Marla Scissors, who passed away from ALS at age 39 in 2008. Marla took no shortcuts in the kitchen and her perfect pastries showed her attention to detail. We are featuring two versions of her cheesecake: Vanilla Cheesecake with Tart Cherry Topping and Double Chocolate Cheesecake. Both cakes are sensational. 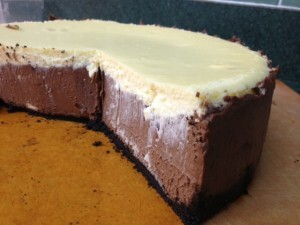 Cheesecake is Number 24 on the Top Thirty Recipes Celebrating the Thirtieth Anniversary of Kitchen Conservatory. To taste this cheesecake, sign up for “The Big Cheese…Cake” on April 3 with Naam Pruitt.